Danny Higginbotham says Liverpool’s recent blip is down to injuries in their defence and rejected suggestions the pressure of the title race is getting to them. Claims pressure has caused Liverpool's dip in form are wrong, says Danny Higginbotham, who says injuries have hit the club hard. 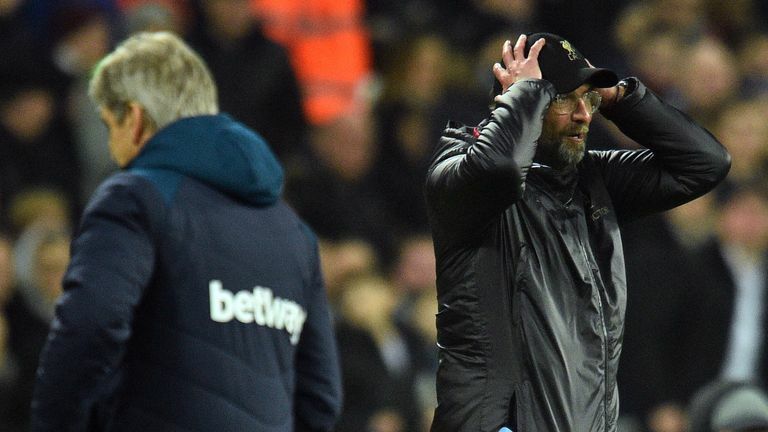 Liverpool have dropped seven points in their last five games, more than they let slip in their first 20 - and they have drawn back-to-back matches with Leicester and West Ham in their last two fixtures. But suggestions the title talk is getting to Jurgen Klopp and his side are wrong, Higginbotham told The Debate, and said instead the loss of Joe Gomez, Dejan Lovren and Trent Alexander-Arnold have proved more problematic. He said: "I'm not buying into the results being down to pressure and everything getting to Liverpool, I don't agree with that. I think that what's happened is we're used to seeing Liverpool winning games because of their forwards in the last few years. "That's not the case at the moment, it's the defence doing it, the amount of clean sheets they've been having but they've lost two of their back four. That's been a real issue for them. "There's a number of players having a dip, and I think you look at Manchester City, the substitutions they made last night - De Bruyne and Jesus came on, and they linked up for the second goal. "The only players Man City can't afford to lose are Ederson and Fernandinho. Liverpool have a lot more than that, and I think it's there for Manchester City - and I think they'll have enough." Fellow panellist Andy Townsend agreed Liverpool's results had been a concern but said he felt they still had enough to grind their way to the Premier League title, as they still retain a game in hand over first-placed Manchester City, who lead them only on goal difference. He said: "The momentum is with Manchester City for sure, but I'm going to stand by Liverpool, get over the line and win it. It won't be easy, it could well go right to the very last game. "The first 10 or 15 minutes against Bournemouth on Saturday is going to be enormous. If they get in front, and settle everyone down, all of a sudden things can change. "The last two results haven't been disastrous, they haven't been great, they haven't played well, we all know that, there's people coming in in positions and filling in here and there, but they've been far from desperate. "The wheels haven't fallen off and you're thinking there's no way back, they can still do it and I think they will."